On Friday, 5 September 2014, all the IGCSE Music students had the unique opportunity to attend a composition workshop, focusing on their current their music compositions for their IGCSE course. 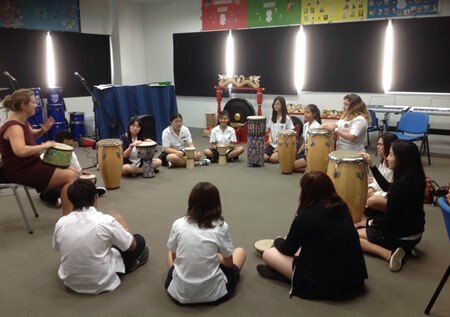 The main objective was for students from both campuses – St. Andrews Sukhumvit 107 and Green Valley – to create their own inspirational compositions within a certain time limit, focusing on the areas of studies covered in class such as: Minimalism, 12 Bar Blues – Jazz/Fusion and African Drumming. 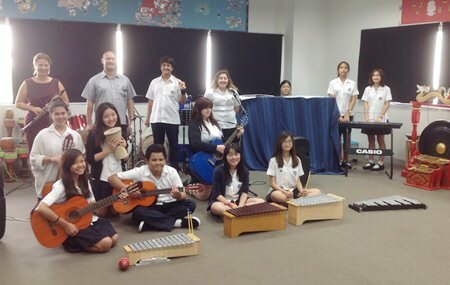 Students from both schools worked collaboratively and benefitted greatly from various workshops offered by Mr. M Müller and Ms. Sian Jones, the music teachers from both schools. St. Andrew students and teachers work collaboratively on their music compositions. All the students enjoyed this day of musical creativity immensely and both campuses look forward to more musical collaboration throughout the year. Music students enjoying the workshops during the day.